On 5 April, Hayabusa2 released an experiment called the ‘Small Carry-on Impactor’ or SCI for short, carrying a plastic explosive charge that shot a 2.5-kg copper projectile at the surface of the 900-m diameter Ryugu asteroid at a velocity of around 2 km per second. The objective is to uncover subsurface material to be brought back to Earth for detailed analysis. “We are expecting it to form a distinctive crater,” comments Patrick Michel, CNRS Director of Research of France’s Côte d’Azur Observatory, serving as co-investigator and interdisciplinary scientist on the Japanese mission. “But we don’t know for sure yet, because Hayabusa2 was moved around to the other side of Ryugu, for maximum safety. “The asteroid’s low gravity means it has an escape velocity of a few tens of centimetres per second, so most of the material ejected by the impact would have gone straight out to space. But at the same time it is possible that lower-velocity ejecta might have gone into orbit around Ryugu and might pose a danger to the Hayabusa2 spacecraft. According to simulations, the crater is predicted to have a roughly 2 m diameter, although the modelling of impacts in such a low-gravity environment is extremely challenging. It should appear darker than the surrounding surface, based on a February touch-and-go sampling operation when Hayabusa2’s thrusters dislodged surface dust to expose blacker material underneath. “For us this is an exciting first data point to compare with simulations,” adds Patrick, “but we have a much larger impact to look forward to in future, as part of the forthcoming double-spacecraft Asteroid Impact & Deflection Assessment (AIDA) mission. “In late 2022 the US Double Asteroid Redirect Test or DART spacecraft will crash into the smaller of the two Didymos asteroids. The DART spacecraft will have a mass of 550 kg, and will strike Didymoon at 6 km/s. Striking an asteroid five times smaller with a spacecraft more than 200 times larger and moving three times faster should deliver sufficient impact energy to achieve the first ever asteroid deflection experiment for planetary defence. A proposed ESA mission called Hera would then visit Didymos to survey the diverted asteroid, measure its mass and perform high-resolution mapping of the crater left by the DART impact. “The actual relation between projectile size, speed and crater size in low gravity environments is still poorly understood,” adds Patrick, also serving as Hera’s lead scientist. “Having both SCI and Hera data on crater sizes in two different impact speed regimes will offer crucial insights. “These scaling laws are also crucial on a practical basis, because they underpin how our calculations estimating the efficiency of asteroid deflection are made, taking account the properties of the asteroid material as well as the impact velocity involved. “This is why Hera is so important; not only will we have DART’s full-scale test of asteroid deflection in space, but also Hera’s detailed follow-up survey to discover Didymoon’s composition and structure. Hera will also record the precise shape of the DART crater, right down to centimetre scale. Didymoon will also be by far the smallest asteroid ever explored, so will offer insights into the cohesion of material in an environment whose gravity is more than a million times weaker than our own – an alien situation extremely challenging to simulate. In 2004, NASA’s Deep Impact spacecraft launched an impactor into comet Tempel 1. The body was subsequently revisited, but the artificial crater was hard to pinpoint – largely because the comet had flown close to the Sun in the meantime, and its heating would have modified the surface. 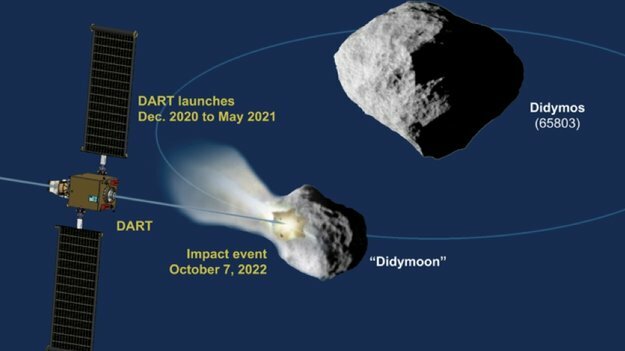 Hera will visit Didymoon around four years after DART’s impact, but because it is an inactive asteroid in deep space, no such modification will occur. “The crater will still be ‘fresh’ for Hera,” Patrick concludes. With rogue asteroids and comets on the move, space can sometimes be a bit of a warzone. Serious impacts with Earth are few and far between. But these collisions can be catastrophic (just ask a few disgruntled dinosaurs circa 66 million years ago)—and Earthlings are often caught unaware. That’s why a team of NASA astronomers has spent the past five years scouring the skies for near-Earth objects (NEOs)—asteroids and comets that orbit the Sun in our vicinity—in the hopes of potentially staving off impending doom. The endeavor is a part of NASA’s Near-Earth Object Wide-field Infrared Survey Explorer (NEOWISE) mission, an Earth-orbiting satellite equipped with cameras and an infrared-sensitive telescope. And the spacecraft, which isn’t limited to tracking the trajectories of asteroids, has kept itself busy: In the past half decade, it has recorded more than 95 billion measurements of asteroids, comets, stars, and galaxies, with data collection ongoing. These measurements have revealed more than 1,000 wayfaring asteroids near our planet in the past half decade. None of these NEOs currently pose any threat to us here on Earth. But according to NASA estimates, about 20,000 near-Earth objects have flitted in and out of our neighborhood in recent decades—almost 900 of which were more than 3,200 feet across. 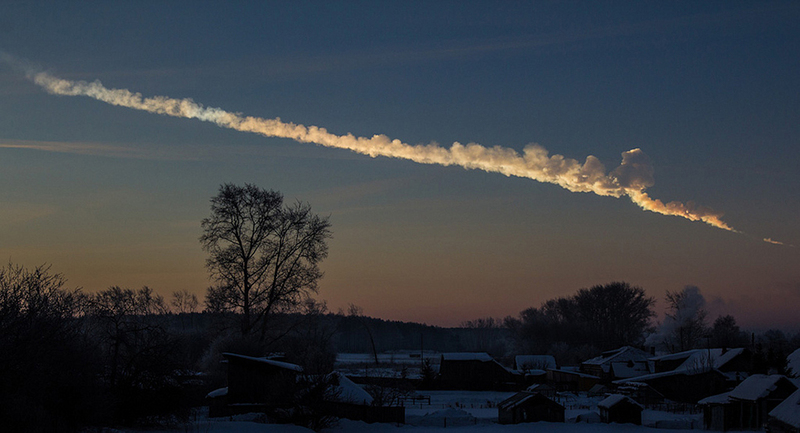 And it was only six years ago that a meteor just 66 feet in diameter injured over 1,500 people when it exploded over the Russian region of Chelyabinsk. Detecting rocky interlopers, however, is no easy task. Because NEOs are often so small and far away, they’re frustratingly hard to spot under even the best of circumstances. What’s more, under visible light, these objects can look as dark as coal or printer toner, making them hard to pick out against the black backdrop of space. But the NEOWISE telescope has found a clever workaround—one that essentially involves it donning a set of cosmic night vision goggles. Heated by the warmth of the Sun, rocky bodies near Earth emit an infrared glow. By working in infrared, the telescope can pick up on any objects that are comin’ in hot, providing Mainzer’s team with images that reveal properties like a NEO’s size, mass, and composition. These measurements could someday help engineers calculate the amount of energy needed for a spacecraft to “nudge” (or detonate) a looming asteroid off an Earthbound path. 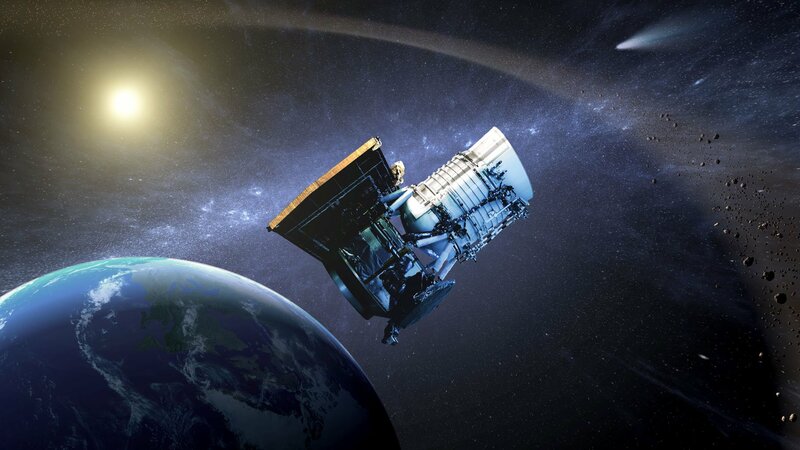 The NEOWISE spacecraft, which was initially launched for a separate mission in 2009, will eventually reach the end of its tenure when its changing orbit prevents it from acquiring high-quality data. But a plan is already in the works to succeed it with another telescope called NEOCam—a new and improved addition to the NEO suite that will purposefully be designed to peer into space for asteroids. If funded, NEOCam will “do a much more comprehensive job of mapping asteroid locations and measuring their sizes,” Mainzer said in the statement. NEOCam’s fate hasn’t yet been decided. For now, its predecessor remains on the frontlines of defense, and will still be actively collecting data. So for any asteroids, comets, or meteors headed our way, the message is clear: Earth has plans to take the heat—and it starts with taking note of it. Tags: Asteroids, By simulating conditions in the early solar system researchers can calculate the ratio of heavy water to ordinary water when the planets were forming., Comets ( 37 ), From Astronomy Magazine: "Where did Earth's water come from? ", Reservoirs with a high quantity of heavy water have a high D/H ratio while deuterium-poor reservoirs show a lower ratio., What do the samples suggest is the source of Earth’s water? Hallis suspects it came from the solar nebula., When hydrogen-rich and oxygen-rich minerals melt because of the mantle’s heat the resulting water can spew from the planet’s crust., When the European Giotto spacecraft visited Halley’s Comet in 1986 researchers noticed its heavy water content was higher than the gas in Earth’s part of the early solar system. 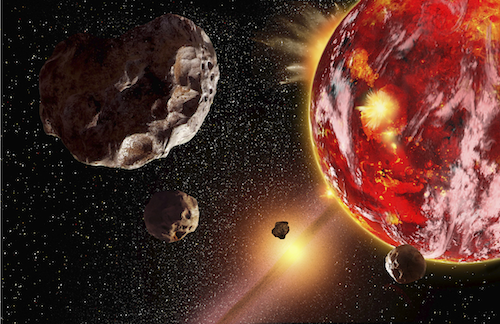 Most astronomers believe asteroids carried water to early Earth. But new research suggests it may have come from even closer to home. Asteroids could have carried water, locked away in their minerals, to a young Earth, depositing it through impacts during our planet’s early years. But this isn’t the only possible explanation for our watery world. Ron Miller for Astronomy. Karen Meech doesn’t spend a lot of time digging through Earth’s rocks. An astronomer by trade, she is usually behind the telescope, investigating comets and looking for hints about how Earth got its water. But a field trip to Iceland in 2004 ultimately sent her scrambling through the craters of Hawaii nearly a decade later in search of clues about the liquid that helped birth life on this planet. 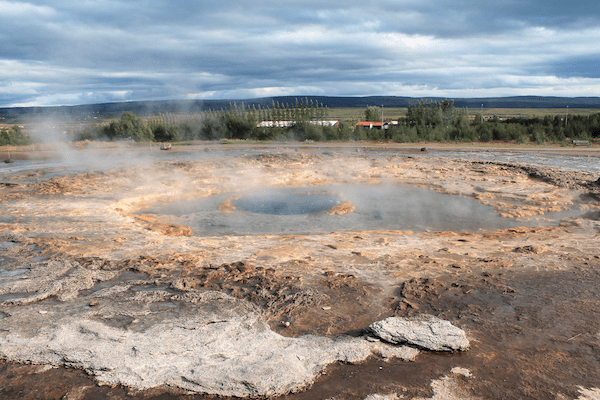 On that fateful Icelandic tour, Meech saw geothermal areas with gas billowing out of the ground. The guide told the group not to worry — it was only water. “Then she said, ‘This is probably primordial water,’ and it set a lightbulb off,” Meech says. The source of Earth’s water has been a long-standing mystery; Meech herself has been trying to solve it for at least 20 years. Most of that search has focused on sorting out the various isotopes of hydrogen that go into making the water — or “the flavor of water,” as Lydia Hallis of the University of Glasgow calls it. One of those “flavors” is heavy water, a form of water that incorporates deuterium, an isotope of hydrogen whose nucleus contains one proton and one neutron. 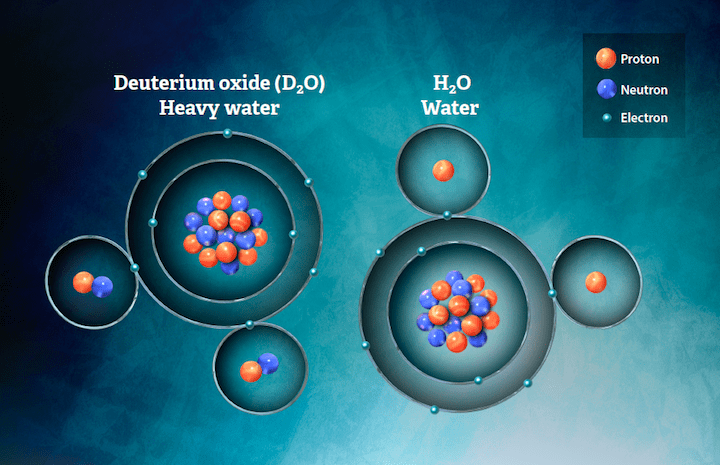 Normal hydrogen lacks a neutron, so water with deuterium weighs more than ordinary water. By simulating conditions in the early solar system, researchers can calculate the ratio of heavy water to ordinary water when the planets were forming. On Earth, the observed ratio is higher than it would have been in the young solar system, leading many astronomers to suspect that the water was imported because the ratio should remain constant over time. Today, most scientists believe asteroids carried water to the young, dry Earth. Meech was suspicious of this idea because measurements of Earth’s deuterium-to-hydrogen (D/H) ratio, which is connected to the ratio of heavy water to normal, is generally based on the composition of today’s oceans. Reservoirs with a high quantity of heavy water have a high D/H ratio, while deuterium-poor reservoirs show a lower ratio. 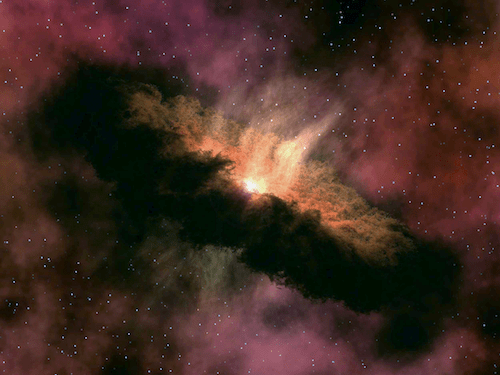 Earth formed from the dust and gas of the nebula that surrounded our infant Sun. This artist’s concept shows the protoplanetary disk of material around a young star. The disk contains the individual components of water — hydrogen and oxygen — and water in both ice and vapor forms. NASA/JPL-Caltech. But Earth’s ratio should have changed over time. Like most planets, Earth probably lost some of its atmosphere to space, and the lighter hydrogen would be easier to strip from the planet than its heavier counterpart. Geological processes, such as the evaporation of water from reservoirs such as lakes and oceans, can also change the ratio, as can biological reactions, because lighter isotopes are used differently than heavier ones in metabolic processes. All of these processes would give the modern Earth a higher D/H ratio compared with when the planet was newly formed. When Meech heard that primordial water could be spouting from the surface in Iceland, she grew excited at the chance to study the earliest flavor of water. But after chatting with a geologist, she learned that the plumes actually came from more recent activity — they weren’t primordial after all. However, the geologist revealed that some rocky material brought up from Earth’s mantle does contain small traces of water. That material may never have mixed with the stuff on the surface and could represent Earth’s early water. No one had investigated the D/H ratio in those samples because the technology to do so was new. But the University of Hawaii, where Meech is based, had just purchased a new ion microprobe that might be able to do the job. Earth and the rest of the planets formed inside a nest of gas left over from the birth of the Sun. This material, known as the solar nebula, contained all the elements that built the planets, and the compositions varied with distance from the Sun. The region near the star was too warm for some material to coalesce as ices, which instead formed in the outer part of the solar system. Around Earth, hydrogen and other elements could stick around only as a gas. Because the nebula was short-lived, most scientists suspect that Earth didn’t have enough time to collect these gases before they escaped into space. That idea, along with the planet’s high D/H ratio, led many to believe that Earth’s water must have arrived after Earth had cooled. When the European Giotto spacecraft visited Halley’s Comet in 1986, researchers noticed its heavy water content was higher than the gas in Earth’s part of the early solar system. A new theory emerged: Comets could have carried water to early Earth. After the planets formed, the enormous bodies would continue to stir things up, with giant planets like Jupiter hurling some material toward the inner solar system. Icy objects that formed in the outer solar system could have been tossed at Earth to rain down as giant water-laden impacts. Heavy water, or D2O, contains deuterium in place of hydrogen. Deuterium is an isotope of hydrogen whose nucleus contains one proton and one neutron, whereas normal hydrogen contains only a proton. The ratio of heavy water to normal water in a sample gives scientists information about how it formed — information researchers are now using to try to unravel the origin of Earth’s water. Astronomy: Roen Kelly. But as other missions probed more comets, it became clear that the amount of heavy water wasn’t consistent among them. In fact, most of the comets’ heavy water ratios were far too high to be responsible for dropping water on Earth. Another culprit must be responsible. Comets weren’t the only thing that the gas giants tossed around. As Jupiter plowed through the asteroid belt early in our solar system’s history, it scattered the rocky debris in all directions. Like comets, some of the material rained down on Earth. Unlike comets, asteroids don’t lock up water as ice. Instead, they trap its components — hydrogen and oxygen — inside minerals. Also, the heavy water content in asteroids falls much closer to Earth’s current ratio. That’s why asteroids are the leading suspect for the source of our planet’s water. “Really, we’re not talking about water; we’re talking about hydrogen,” says Anne Peslier, a geochemist at NASA’s Johnson Space Center. Peslier studies the geochemistry of Earth’s mantle and the other terrestrial planets, including the hydrogen trapped within minerals. When Earth formed, the hydrogen surrounding the growing planet was captured in its rocks and minerals. When hydrogen-rich and oxygen-rich minerals melt because of the mantle’s heat, the resulting water can spew from the planet’s crust. Most of the mantle is rocky, and enormous quantities of hydrogen and oxygen could be trapped inside. Researchers estimate that as much as 10 oceans of water may exist within the mantle. Erupting volcanoes usually bring up magma from the upper part of Earth’s mantle, the region closer to the surface. This material is more likely to be polluted by hydrogen from the crust, which contains the same higher D/H ratios measured in the oceans today. More pristine samples lie much farther down in the mantle. Although it’s hot there, less than 20 percent of the mantle rock has melted, Peslier says. When the melted material erupts, it can have a violent effect on the solid rock. “If [the lavas] go fast enough and brutally enough, they sometimes break off pieces of what they are traversing along the way,” Peslier says. She describes the result — called mantle xenolith, after the Greek word for “foreign rock” — as crystals of bright green olivine and black pyroxene embedded in the black lava. If the hydrogen-rich olivine crystals were captured early enough during Earth’s formation and remained undisturbed for the planet’s 4.5 billion-year lifetime, they could reveal how much the ancient ratios of heavy and normal water shifted, if they changed at all. The tiny time capsules could provide answers to the long-standing questions regarding the source of Earth’s water. But first, they had to be found. While Meech knows a great deal about water in the solar system, she wasn’t as familiar with rocks on Earth. She pulled in Hallis, then a postdoctoral student, to lead geological excavations in a hunt for those early fingerprints of normal and heavy water. Hallis was intrigued by the chance to scramble across craters in Hawaii and along the shores of Baffin Island in Canada in search of clues. Baffin is one of the few places where Earth’s deep mantle is accessible. The chain of eruptions that formed the island also created Greenland and Iceland. “The Baffin Island samples are the most pristine examples that we have of the deep mantle,” Hallis says. Hallis also received samples collected by Don Francis, now an emeritus professor at McGill University in Montreal, from a tiny uninhabited island called Padloping, off the eastern coast of Canada and northwest of Baffin Island. According to Hallis, Francis collected the first of his samples in 1985. The isolation of Padloping Island meant that researchers had to travel there by boat and set up camp. The sheer cliffs made falling rocks plentiful, and Francis picked up the best-looking minerals from the beach. A return trip in 2004 netted even more samples. “Something I would really like to do is go back [to Padloping Island],” Hallis says. The imposing cliffs make it challenging to collect samples, but if she could obtain some from the steep overhangs, she would be able to pinpoint where and when the material rose to the surface. 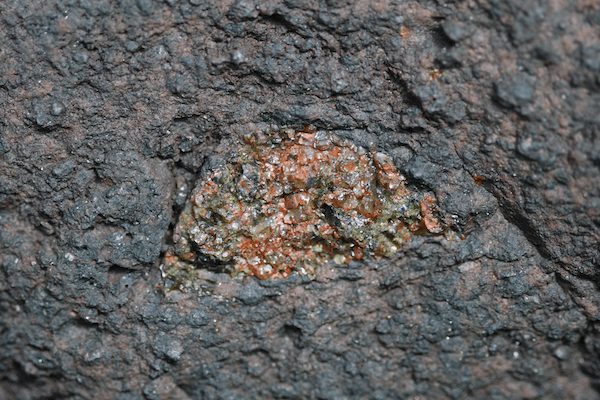 Green olivine crystals in lava can contain and protect hydrogen collected during Earth’s formation, allowing researchers to determine its ratio of deuterium to hydrogen. With the well-preserved samples in hand, Hallis and her colleagues began to systematically destroy them. The rocks were ground up into sandlike powder. Using the microprobe, the scientists sorted the enclosed crystals by color. Meech helped to categorize the crystals. “I found it hard to manipulate the tiny little bits of sand without spilling them on the floor,” she admits ruefully. Part of the process involved ensuring the samples were stripped from the mantle rather than the crust as the volcanic plume burst upward. Previous studies of the Baffin Island minerals suggested that they came from the mantle’s depths, and mineralogical evidence revealed that the samples Hallis had in the lab were most likely pristine. The tiny glass beads were protected in part by olivine crystals, which act as a barrier to prevent weathering once the rocks are on the surface. Even so, they weren’t entirely perfect. While the Baffin Island samples were free of crust pollution, the team wasn’t so fortunate with the rocks gathered near their university. The Hawaiian minerals had suffered from weathering and had been heavily affected by surface water, most likely rain. The pollution kept these samples from revealing the flavors of pristine water. With the first fingerprints of Earth’s water finally taken, Meech and Hallis began to compare them with other samples. Hallis expected to observe a heavy water content closer to the meteorites thought to have delivered water to the young planet. Instead, the samples weighed in with about 25 percent less heavy water compared with normal water — far less than expected. “That was a bit of a surprise,” Hallis says. “It suggests that carbonaceous chondrites [a class of meteorites] are not a good fit for the source of Earth’s water.” While meteorites may have provided some of Earth’s water, she doesn’t think that they delivered all of it. What do the samples suggest is the source of Earth’s water? Hallis suspects it came from the solar nebula. While many scientists argue that the nebula would have dissipated within 6 million years — long before our planet could have grown large enough to capture it — she points out that several young stars have been found with gas around them for as long as 10 million years. That would give the tiny rocks that ultimately built Earth enough time to incorporate elements like hydrogen and nitrogen into their structure. Hallis says nitrogen and hydrogen in the solar system tend to follow one another — “If you have a certain flavor of hydrogen, you have a certain flavor of nitrogen,” she says. “Perhaps you still have pockets in the Earth that have preserved this initial hydrogen source,” says Zachary Sharp, a researcher at the University of New Mexico who also suspects that Earth’s D/H ratio has shifted over time. Geysers such as Strokkur in Iceland inspired Karen Meech to hunt for Earth’s primordial water. Although such geysers do not spew the unaltered early water needed to pursue this line of study, other geological processes, such as volcanic plumes, do. Ivan Sabljak/Wikimedia Commons. Hallis’ results aren’t the only ones to suggest that Earth may have picked up the bulk of its water from the start. While the Moon was once thought to be completely dry, recent re-examinations of Apollo Moon rocks have revealed traces of water. The leading theory for the Moon’s formation is that it was created when a Mars-sized object slammed into the young Earth. Liquid water on the surface would have been vaporized, leading many to conclude that Earth had to pick up more water from elsewhere. But the low D/H ratios from the lunar samples suggest that the Moon could have collected the water in minerals locked in its interior, a region neither comets nor asteroids could have polluted. Later volcanic eruptions hurled that material to the surface, to be returned to Earth by astronauts. Why is this important? The high temperatures post-collision would have been similar to those found in the solar nebula, Hallis says. That helps to make the case that even in the hot early solar system, volatiles and water could be accreted. But hydrogen comes in heavy and light flavors, so doesn’t that mean the ratio could change in either direction? Not really, according to Sharp, who has revisited the idea that most of Earth’s water may have been collected from the nebula rather than later collisions. “It’s easy to increase the isotopic ratio of the samples, but it’s difficult to lower them,” he says. That’s because the lighter hydrogen is easier to remove. For instance, hydrogen rises more easily to the top of the atmosphere, where the solar wind can strip it away. The heavier deuterium tends to stay closer to the ground. Asteroids are also providing hints that Earth’s water may have come from the gas that birthed the planets. Studies of meteorites from the large asteroid Vesta have revealed ratios of heavy water similar to the Baffin Island estimates. Padloping Island is isolated, uninhabited, and home to what may be some of Earth’s oldest rock. Future expeditions to this island in Canada may confirm preliminary findings that our Sun’s protoplanetary nebula may have stuck around long enough for a forming Earth to capture hydrogen — a building block of water. Doc Searls/Flickr. The lower D/H ratios revealed by Hallis, Meech, and their colleagues are not yet widely accepted. Conel Alexander, a cosmo-chemist at the Carnegie Institution of Washington, says there are two reasons why other researchers didn’t immediately change their minds about the source of Earth’s water. Alexander’s chief concern stems from the fact that only a single source of rocks — the Baffin Island samples — was used to estimate the entire planet’s ancient ratios. “The bulk of Earth may have a completely different composition, and there may be something weird about ocean islands’ basalts,” he says. He hopes that other scientists will follow Hallis’ lead and measure the D/H ratio from a variety of deep-mantle plumes. Hallis is ready to take her own trip to Padloping Island to collect more samples. One thing she would like to do is investigate not just the hydrogen involved, but also the nitrogen. But analyzing the nitrogen in samples is more difficult than hunting down hydrogen, partly because there is even less nitrogen in these samples than hydrogen. Measuring nitrogen also requires instruments capable of very high precision. Hallis says it’s pushing the limit of what current technology can do. Alexander says that Hallis’ goal of hunting down nitrogen from future samples will also help firm up any doubts about the primordial nature of the Baffin Island samples. “If she can show that there is both light hydrogen and light nitrogen in these inclusions, I think that would be a smoking gun,” he says. “If the nitrogen follows the hydrogen, then we proved our theory that [the samples] are primitive,” Hallis says. A huge fireball exploded in the Earth’s atmosphere in December, according to NASA. The blast was the second largest of its kind in 30 years, and the biggest since the fireball over Chelyabinsk in Russia six years ago. 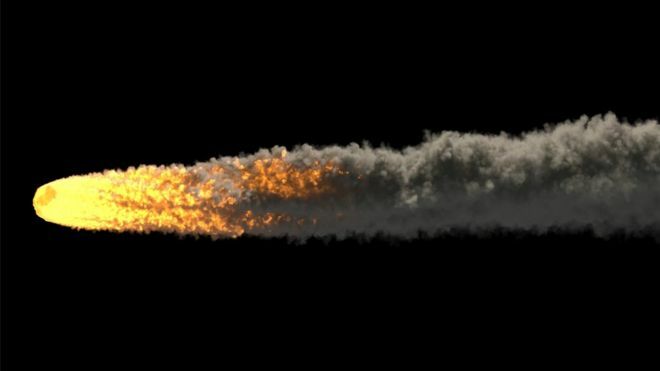 Lindley Johnson, planetary defence officer at NASA, told BBC News a fireball this big is only expected about two or three times every 100 years. At about noon local time on 18 December, the asteroid barrelled through the atmosphere at a speed of 32km/s (20 miles per second) , on a steep trajectory of seven degrees. Measuring several metres in size, the space rock exploded 25.6km above the Earth’s surface, with an impact energy of 173 kilotons. 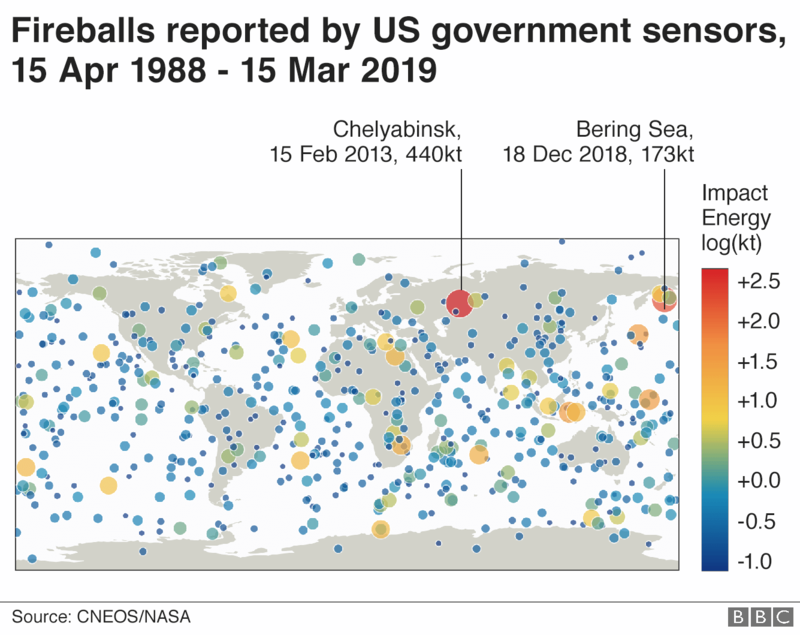 “That was 40% the energy release of Chelyabinsk, but it was over the Bering Sea so it didn’t have the same type of effect or show up in the news,” said Kelly Fast, near-Earth objects observations programme manager at Nasa. Dr Fast was discussing the event here at the 50th Lunar and Planetary Science Conference in The Woodlands, near Houston, Texas. Military satellites picked up the blast last year; NASA was notified of the event by the US Air Force. Dr Johnson said the fireball came in over an area not too far from routes used by commercial planes flying between North America and Asia. So researchers have been checking with airlines to see if there were any reported sightings of the event. In 2005, Congress tasked NASA with finding 90% of near-Earth asteroids of 140m (460ft) in size or larger by 2020. Space rocks of this size are so-called “problems without passports” because they are expected to affect whole regions if they collide with Earth. But scientists estimate it will take them another 30 years to fulfill this congressional directive. Once an incoming object is identified, NASA has had some notable success at calculating where on Earth the impact will occur, based on a precise determination of its orbit. In June 2018, the small 3m (10ft) asteroid 2018 LA was discovered by a ground-based observatory in Arizona eight hours before impact. The Center for Near-Earth Object Studies at Nasa’s Jet Propulsion Laboratory (JPL) then made a precision determination of its orbit, which was used to calculate a probable impact location. This showed the rock was likely to hit southern Africa. Just as the calculation suggested, a fireball was recorded over Botswana by security camera footage on a farm. Fragments of the object were later found in the area. How can monitoring be improved? 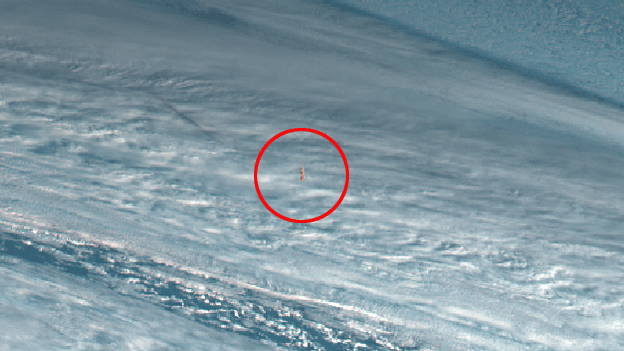 The latest event over the Bering Sea shows that larger objects can collide with us without warning, underlining the need for enhanced monitoring. A more robust network would be dependent not only on ground telescopes, but space-based observatories also. A mission concept in development would see a telescope called NeoCam launched to a gravitational balance point in space, where it would discover and characterise potentially hazardous asteroids larger than 140m. Dr Amy Mainzer, chief scientist on NeoCam at JPL, said: “The idea is really to get as close as possible to reaching that 90% goal of finding the 140m and larger near-Earth asteroids given to Nasa by Congress. She said that if the mission did not launch, projections suggested it would “take us many decades to get there with the existing suite of ground-based surveys”. The mission to the smallest asteroid ever explored will employ the same main camera as the mission to the largest asteroids of all. ESA’s proposed Hera spacecraft to the Didymos asteroid pair has inherited its main imager from NASA’s Dawn mission to the Vesta and Ceres asteroids. Hera is currently the subject of detailed design work, ahead of being presented to Europe’s space ministers at the Space19+ Ministerial Council at the end of this year, for launch in late 2023. The spacecraft will survey a tiny 160-m diameter moon of the 780-m diameter Didymos asteroid, in the aftermath of a pioneering planetary defence experiment. But the Asteroid Framing Camera (AFC) Hera will use to navigate through space and survey its targeted double asteroids is already built and ready. Two of these cameras – Hera will carry a pair, for redundancy – are sitting in protective nitrogen gas inside a clean room in Göttingen, Germany. “The AFC was designed specifically for NASA’s Dawn mission to the two largest bodies in the Asteroid belt: Vesta, at 525 km across, and 946 km diameter Ceres,” explains Holger Sierks of the Max Planck Institute for Solar System Research. “There was no other camera aboard the spacecraft so the AFC had a mission-critical role, being employed both for navigation and scientific investigation. “The AFC worked like Swiss clockwork throughout Dawn’s 11-year lifetime. Before Dawn finally ended in November 2018 the spacecraft came as close as 30 km from the surface of Ceres, and returned spectacular views of its striking bright spots. Two AFC flight units were supplied to NASA by the Institute, in cooperation with the DLR German Aerospace Center and the Technical University of Braunschweig’s Institute of Computer and Network Engineering. A spare camera was built and kept at the Institute to replace a flight unit if needed. The 5.5 kg AFC resembles a computer printer-sized box containing power and mass memory with a thermally insulated telescope extending out from it. Maximum image sensitivity is ensured by cooling the telescope’s CCD light detector down to -60 °C. One qualification model camera has already been lent to GMV in Spain as they develop autonomous navigation systems for Hera. This allows the team to test their feature-detecting algorithms with the same hardware as will actually be flown. Hera’s planetary defence purpose feels personal to Holger and the rest of the Institute team. The team recently met in the German town of Nördlingen, located inside a 24-km diameter crater, formed by an impacting binary asteroid just like Didymos and its moon an estimated 14 million years ago. A former NASA astronaut says the agency he used to work for has a duty to protect civilians from killer asteroids, but that it isn’t meeting that obligation. In 1908, a space rock estimated to be several hundred feet in diameter screamed into Earth’s atmosphere at many thousands of miles per hour, causing the foreign body to explode over the remote Tunguska region of Russia with the force of a thermonuclear weapon. In 2005 Congress made one of the agency’s seven core goals to track down 90 percent of asteroids 460 feet (140 meters) and larger, which could lead to a worse-than-Tunguska-level event. The deadline for this legally mandated goal is 2020. Russell “Rusty” Schweickart, an aerospace engineer retired astronaut who flew on the Apollo 9 mission, says there is a solution in waiting for this problem: NASA can launch the Near-Earth Object Camera (NEOCam), which is a small infrared observatory, into space. “It’s a critical discovery telescope to protect life on Earth, and it’s ready to go,” Schweickart told Business Insider at The Economist Space Summit on November 1. NEOCam’s designers have pitched the mission to NASA multiple times. The mission has received several million dollars here and there to continue its development in response to those proposals, but the agency has denied full funding in every instance on account of it not being the best purely science-focused mission. Telescopes that are looking in the right place at the right time can detect a dot of that light sneaking across the blackness of space. This allows scientists to calculate an NEO’s mass, speed, orbit, and the odds that it will eventually smack into Earth. Small NEOs, though, aren’t very bright. This means a telescope has to be big, see a lot of the sky, and use very advanced hardware to pick them up. These monstrous telescopes take a very long time to build and calibrate and are budget-crushingly expensive. Take the Large Synoptic Survey Telescope (LSST), for example, which is one of Earth’s best current hopes of finding killer asteroids. The project broke ground in 2015 and is expected to cost about half a billion dollars to build. Based on its current construction schedule, it won’t be fully operational until late 2021, at the soonest, or able to fulfill the 90 percent detection goal set by Congress until the mid-2030s. The first: “You can’t see asteroids near the Sun. You’re blinded by the sky,” Mark Sykes, director of the Planetary Science Institute and a scientist on the NEOCam team, previously told Business Insider. Sykes said the second snag is that ground-based telescopes mainly rely on visible light for detection. “If [an asteroid] has a dark surface, it’s going to be very hard to see,” he said. The telescope would also use an advanced, high-resolution infrared camera. Infrared is a longer wavelength of light that’s invisible to our eyes, but if a source is strong enough – say, a roaring fire – we can feel invisible light as warmth on our skin. Asteroids warmed by the Sun, radioactive elements, or both will emit infrared light, even when they’re too small or dark for ground-based telescopes to see. Which means NEOCam could spot them merely by their heat signatures. The prime example is NASA’s eight-year-old Wide-field Infrared Survey Explorer (WISE) telescope, which has found roughly 275 NEOs, including 50 potentially hazardous asteroids, or PHOs (so named because they come within 4.6 million miles of Earth at some point in their orbits). However, it’s a less powerful telescope, has a smaller field of view, an older camera that requires cryogenic cooling that eventually runs out (NEOCam’s doesn’t need it), and wasn’t designed just to hunt asteroids. According to a recent study in The Astronomical Journal, neither NEOCam nor LSST alone would ever achieve Congress’ 90 percent detection mandate – only by working together, the research found, could the observatories achieve that goal over a decade. In its latest pitch to NASA, the NEOCam team proposed to launch in 2021 and find two-thirds of missing objects in the larger-than-460-feet (140 meters) category within four years, or about a decade ahead of LSST’s schedule. Less than 70 percent of all NEOs that are 460 feet (140 meters) or larger have not been found, according to a report published by the White House’s National Science and Technology Council (NSTC) in December 2016. The NASA competition it was a part of, called Discovery, values scientific firsts – not ensuring humanity’s safety – and thus did not grant NEOCam nearly US$450 million to develop its spacecraft and a rocket with which to launch it. For Schweickart’s part, he doesn’t care about the distinction. “In the meantime, NEOCam is in a zombie state and all the while Earth waits inevitably in the crosshairs,” Richard Binzel, a planetary scientist and expert on the hazards posed by asteroids at Massachusetts Institute of Technology, told Business Insider in an email. Binzel is one of three scientists who wrote a recent op-ed in Space News in support of fully funding the project, even though they’re not on the project’s team. Binzel and others argue NEOCam could get launched by raising the House of Representatives’ proposed budget for NASA planetary defence by another US$40 million (up from a US$160 million to US$200 million) and by sharing a rocket ride with a spacecraft called IMAP, which the agency plans to launch in 2024. By working in coordination with ground-based telescopes, NEOCam could achieve nearly 70 percent detection in four years, and the agency’s target of 90 percent detection in less than 10 years. “But the consequences of being wrong are irresponsible, especially when the capability to gain the necessary knowledge is easily within our grasp,” he said. Schweickart acknowledged that NASA’s budgeting and culture has, for decades, been focused on pushing top-tier scientific exploration and that deviating from this norm – Congressional mandate or not – isn’t easy. But the group tabled its longest-running (and most expensive) idea, the Sentinel space telescope, in part to improve NEOCam’s chances of getting funded. On Oct. 29, the organisation even publicized its strong support for lawmakers fully funding its rival. “That’s a February discussion,” Stephen Jurczyk, NASA’s associate administrator, told Business Insider at the Economist Space Summit. Jurczyk acknowledged the tension between NASA’s duty to locate dangerous asteroids along with internal changes required to make that work happen. “It is to some extent a cultural issue, where we kind of have this mentality of pure science and pure competition,” he said. The question is whether those changes will happen before the next Tunguska-type asteroid arrives at Earth. Given enough warning, we might fly out to such a space rock and prevent a calamity or, if there isn’t enough time for that, try to move people out of harm’s way. A team of scientists are currently using ESO’s Very Large Telescope to survey the largest asteroids in the Solar System. Nicknamed HARISSA, the survey has recently gathered lots of information on asteroid Psyche, special because of its metallic nature. In this week’s blog post the team behind the project explain what Psyche can tell us about the history of the Solar System, and how their research will feed into a NASA mission to study the same asteroid. Q. Firstly, could you tell us a bit about the HARISSA survey. Pierre (P): We are finding out more about some of the largest asteroids in the Asteroid Belt using the SPHERE instrument on the Very Large Telescope (VLT). With the VLT, we can see surface features such as craters, allowing us to carry out geology and geophysics from here on Earth for the first time ever. Craters tell us more about the age and collisional history of each asteroid, as a higher number of craters imply an older surface or more violent past. They can also hint at an asteroid’s internal structure. Franck (F): We have been observing asteroids for years using the W.M. Keck Observatory, so when we found out about the VLT’s next-generation adaptive optics system, we couldn’t wait to use it to image asteroids with a much better resolution — four times sharper than that of the Hubble Space Telescope! The survey is still ongoing, and more data is coming, so we hope that there will be some interesting results in the future. Q. So you observed Psyche as part of this HARISSA survey — could you give us a brief overview of how you observed this asteroid and what you found out? P: We combined our VLT observations from May this year with additional data from the last 20 years, many of which came from amateur astronomers! In total, we had 206 data sets for Psyche, and we fed them all into an algorithm to find out about its size and shape. We discovered that it is 226 kilometres wide, with two particularly interesting features — one very bright patch and one huge crater almost half the size of the asteroid itself. F: We named the bright patch Panthia and the crater Meroe after the twin witches in the story Metamorphosis, which Psyche’s name also comes from. We also looked for a moon, because measuring a moon’s orbit could give us a good estimate of Psyche’s mass. But we are now almost certain that Psyche hosts no moons larger than one kilometre in diameter. Q. Could you tell us a bit about asteroids? What are they and why should we study them? F: Asteroids are the remnants of the formation of the Solar System. In a way, they are the “bricks” that make up the Solar System, and it’s important to understand the bricks to understand the whole structure. P: Most asteroids live in the Asteroid Belt between Mars and Jupiter. But we believe that they actually formed in a wider range of locations. Some are very rocky, and probably formed closer to the Sun, and some are more icy, having probably formed further out, between Jupiter and Neptune. There are clear differences between these icy and rocky bodies — rocky asteroids are covered in craters, but the presence of ice smooths these scars on the icy asteroids. Rarer, metal-rich asteroids also exist. Q. Why did you decide to investigate this particular asteroid? Why is it interesting? P: Psyche is much richer in metals than other asteroids, which implies that it formed a very long time ago. Being part of the first generation of planetary building blocks means that it could be useful for understanding the early Solar System. F: Also, past radar observations implied that this asteroid is a metallic world with a metal-rich surface. These types of asteroids are rare compared to rocky and icy asteroids. We are trying to observe all types of asteroids through the HARISSA programme, and Psyche is one of the few large metallic asteroids believed to exist. F: But actually, we were surprised that our observations showed Psyche to be a mesosiderite asteroid, meaning it is a mixture of metal and rock. Mesosiderite meteorites make up just 0.7% of the meteorites found on Earth, making them even rarer than purely metallic meteorites. This leads us to wonder which asteroids they came from and where these parent bodies were formed. And now we consider that Psyche could be the source of these meteorites! P: It is possible that mesosiderite asteroids are the result of a collision between small molten objects and a large asteroid early in the history of the Solar System, or maybe they arose from the breakup and reassembly of a large asteroid. Understanding the formation of Psyche with a dedicated NASA mission will hopefully shed some light on this mystery to tell us more about the early Solar System. That’s really exciting! Q. So why is NASA sending a spacecraft to Psyche? P: Metal-rich asteroids have not been observed in much detail before. And although we have found out a lot from ground-based observations, some measurements can only be done in situ, for example analysing the composition of the rock to find out what elements are on the surface and measuring the magnetic field around Psyche. The NASA spacecraft will carry instruments that can do these things. It will also measure Psyche’s gravity to find out about its interior, possibly helping us determine whether the asteroid formed as a result of a collision. F: Metal-rich asteroids are like a missing piece in the puzzle of our understanding of the formation of the Solar System. And one topic that comes up quite a lot at the moment is asteroid mining. These metal-rich objects are the type that we would mine for precious metals that are becoming more difficult to collect on Earth. But first, we need to answer questions like: how much metal is in the rock? how could we go about extracting it? Moral questions surround asteroid mining, but at least if we understand the science, we can get a broader view of the situation. Q. Will your observations be useful for the NASA mission? F: By carrying out the first exploration of the asteroid, we observed some things that will be very useful for the Psyche mission team, for example, we now know that there is no large moon for the spacecraft to potentially collide with. We also found that the features on the surface vary by about 10% in brightness; this knowledge will help the Psyche team tune their instruments to clearly see surface features — just like when your camera has to adjust to different light levels here on Earth. NASA will use all this information to optimise their mission. For example, they might plan to start by studying the most interesting geophysical areas — Meroe or Panthea, perhaps — as they don’t know exactly how long the spacecraft will survive in deep space. They want to get the most interesting results right at the beginning! Q. What do you hope to do in the future? P: Psyche is moving closer to Earth, so in a few months it will be even larger than when we first observed it. If the HARISSA programme is extended, we hope to get additional observations; new images would allow us to see other sides of the asteroid that weren’t visible when we first observed it in May, meaning we could identify and map new features. 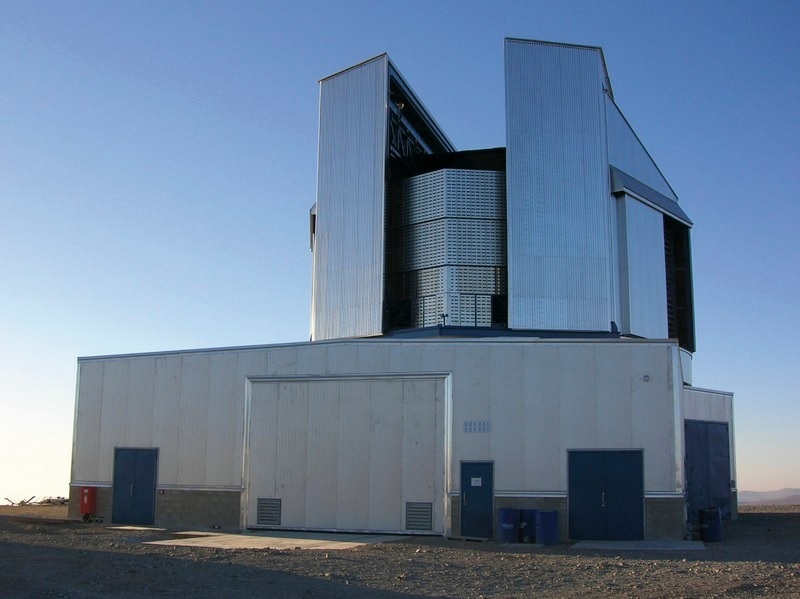 F: We would also like to use the Extremely Large Telescope (ELT) [below] to image this asteroid. The resolution will initially be two to three times better than that of the VLT, so we would be able to see small details on the surface, and to spot if there is a tiny moon. We already have images of the surfaces of the very largest asteroid belt objects, but the ELT will allow us to clearly spot craters on the surfaces of more than 100 asteroids! The animation depicts a mapping of the positions of known near-Earth objects (NEOs) at points in time over the past 20 years, and finishes with a map of all known asteroids as of January 2018. Asteroid search teams supported by NASA’s NEO Observations Program have found over 95 percent of near-Earth asteroids currently known. There are now over 18,000 known NEOs and the discovery rate averages about 40 per week. Image credit: NASA/JPL-Caltech. NASA’s Center for Near-Earth Object Studies Enters Third Decade. On March 11, 1998, asteroid astronomers around the world received an ominous message: new observational data on the recently discovered asteroid 1997 XF11 suggested there was a chance that the half-mile-wide (nearly one kilometer) object could hit Earth in 2028. The message came from the Minor Planet Center, in Cambridge, Massachusetts, the worldwide repository for such observations and initial determination of asteroid orbits. And although it was intended to alert only the very small astronomical community that hunts and tracks asteroids to call for more observations, the news spread quickly. Most media outlets did not know what to make of the announcement, and mistakenly highlighted the prospect that Earth was doomed. Fortunately, it turned out that Earth was never in danger from 1997 XF11. After performing a more thorough orbit analysis with the available asteroid observations, Don Yeomans, then the leader of the Solar System Dynamics group at NASA’s Jet Propulsion Laboratory in Pasadena, California, along with his colleague Paul Chodas, concluded otherwise. “The 2028 impact was essentially impossible,” said Chodas, who is now director of NASA’s Center for Near-Earth Object Studies (CNEOS), located at JPL. Chodas knows this thanks to CNEOS’ precise orbit calculations using observation data submitted to the Minor Planet Center by observatories all over the world that detect and track the motion of asteroids and comets. For the past two decades, CNEOS calculations have enabled NASA to become the world leader in these efforts, keeping close watch on all nearby asteroids and comets — especially those that can cross Earth’s orbit. The animated chart depicts the cumulative number of known Near-Earth asteroids (NEAs) versus time. The area in red depicts the number of known NEAs larger than 0.6 miles (1 kilometer). The area in orange depicts the quantity of known NEAs larger than 460 feet (140 meters). The area in blue depicts the number of known NEAs in all sizes. Image credit: NASA/JPL-Caltech. Near-Earth Objects (NEOs) are asteroids and comets in orbits that bring them into the inner solar system, within 121 million miles (195 million kilometers) of the Sun, and also within roughly 30 million miles (50 million kilometers) of Earth’s orbit around the Sun. The media frenzy around NEO 1997 XF11 demonstrated the need for clarity and precision in communicating with the public about the close passes by Earth of these objects, as well as “the importance of peer review before public statements like these are made,” Chodas said. NASA’s original intent was to fulfill a 1998 Congressional request to detect and catalogue at least 90 percent of all NEOs larger than one kilometer in size (roughly two-thirds of a mile) within 10 years. To help reach the Congressional goal, NASA Headquarters requested that JPL establish a new office to work with the data provided by the International Astronomical Union-sanctioned Minor Planet Center for submission of all observations of asteroids and comets, and to coordinate with observatories operated by academic institutions around the United States, as well as U.S. Air Force space surveillance assets. In 2016, the office was renamed the Center for Near-Earth Object Studies (CNEOS) in conjunction with the establishment of the Planetary Defense Coordination Office (PDCO) at NASA Headquarters in Washington. For about 20 years, CNEOS has been NASA’s central hub for accurately mapping the orbits of all the known NEOs, predicting their upcoming close approaches, reliably assessing their chances of impact to our planet, and delivering that information to both astronomers worldwide and the general public. Observatories around the world take digital images of the sky to detect moving points of light (the asteroid or comet) over days, weeks, months (and even decades! ), and then report the positions of these moving objects relative to the static background of stars to the Minor Planet Center. See “How a Speck of Light Becomes an Asteroid“.The CNEOS scientists then use all this observation data to more precisely calculate an NEO’s orbit and predict its motion forward in time for many years, looking for close approaches and potential impacts to the Earth, its Moon, and other planets. Although the original Congressional goal from 1998 has been exceeded and much progress has been made in asteroid discovery and tracking over the past two decades, the work isn’t over. In 2005, Congress established a new, much more ambitious goal for the NEO Observations Program — to discover 90 percent of the NEOs down to the much smaller size of 450 feet (140 meters), and to do so by the year 2020 (https://www.congress.gov/congressional-report/109th-congress/house-report/158/1). These smaller asteroids may not present a threat of global catastrophe if they impact Earth, but they could still cause massive regional devastation and loss of life, especially if they occur near a metropolitan area. CNEOS continues to make improvements to its orbital analysis tools, image and graphic presentation capabilities, and updates of its websites to quickly and accurately provide the very latest information on NEOs to PDCO, the astronomical community and the public. JPL hosts the Center for Near-Earth Object Studies for NASA’s Near-Earth Object Observations Program, an element of the Planetary Defense Coordination Office within the agency’s Science Mission Directorate. ESA’s Hera mission is designed to test deep space technology while exploring a distant asteroid and investigating a unique, man-made crater, testing a deflection method that may one day prove literally Earth-saving. If all goes to plan, October 2022 will mark a significant achievement in the life of our species: the first time that Homo sapiens shifts the orbit of a body in the Solar System in a measureable way. The target is an approximately 170-m diameter asteroid – about the same size as the Great Pyramid of Giza – which is in orbit around another, larger asteroid: the 780m diameter Didymos (Greek for ‘twin’) near-Earth asteroid.The method is a NASA spacecraft called the Double Asteroid Redirection Test (DART), which will autonomously fly itself into the smaller body at 6km/s, nine times faster than a bullet. The result of the collision with this refrigerator-sized DART spacecraft is expected to be an alteration in the tight 11.9-hour orbit of ‘Didymoon’ around its parent asteroid. This shift should be observable from Earth-based telescopes, because the Didymos binary pair will be on an unusually close approach to our planet at that point, coming just 11 million kilometres away at its nearest. Didymoon’s degree of orbital shift will give researchers essential insights into the internal structure of asteroids and the potential of deflecting them as a means of planetary defence. But monitoring this historic event from a distance will not be sufficient by itself if we are to learn all its lessons. By its very nature the Double Asteroid Redirection Test is a suicide mission, which has some unavoidable drawbacks. The last thing Earth will see in advance of the collision will be a close-up of Didymoon’s surface features – and then nothing. Potentially, DART might also carry a small ‘selfie-sat’ that it deploys beforehand in order to capture imagery of the moment of impact – but even so, past experience suggests nothing will be viewable directly at that point and only very limited data will be available on the surface properties of Didymoon. 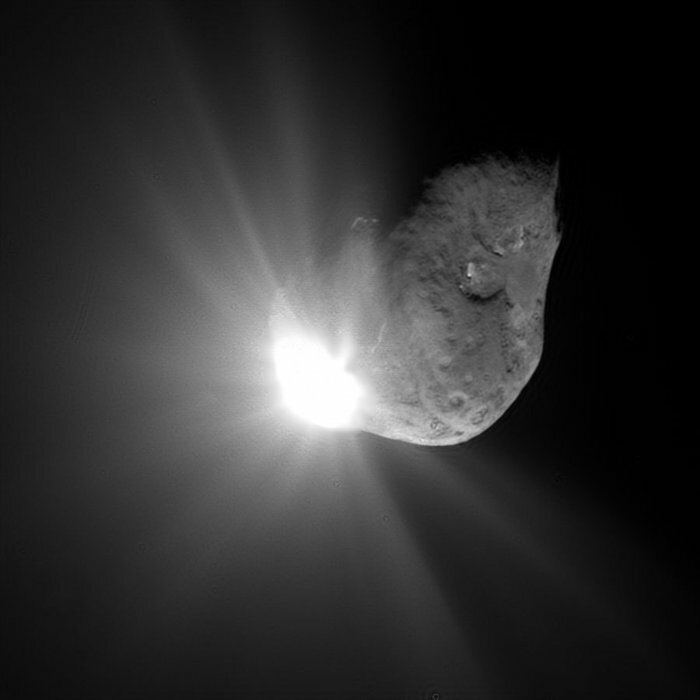 On 4 July 2005, NASA’s spacecraft shot a 370kg copper impactor into comet Tempel 1. Shifting the orbit of this massive 7.6km × 4.9km body was never on the agenda; instead the aim was to expose the comet’s interior. However, in the impact’s aftermath millions of kilograms of dust and ice continued to outgas from the impact zone for days on end. Deep Impact’s follow-on flyby showed nothing; it took a new visit by a separate spacecraft, NASA’s Stardust, in 2011 to finally measure the fresh 150m diameter crater scarring the comet’s surface. Plus, the distance involved means that terrestrial observatories’ measurement of Didymoon’s altered orbit will be stuck with a 10% residual uncertainty. The only way to improve on this, and really hone our understanding of this grand-scale space experiment, and see how the Double Asteroid Redirection Test impact has affected the surface of Didymoon, is to venture much, much nearer. That is the task of ESA’s Hera mission, the optimised design of which benefits from multiple ESA studies of asteroid missions across the last two decades – most recently the proposed Asteroid Impact Mission (AIM), which was planned in conjunction with the Double Asteroid Redirection Test. Hera is a small-scale mission in planetary terms, a large desk-sized spacecraft weighing in at less than 800kg fully fuelled (compared, for instance, to the van-sized, three tonne Rosetta comet-chaser). But it is also a highly agile, ambitious one. In addition to its primary planetary defence objectives, Hera will demonstrate the ability to operate at close proximity around a low-gravity asteroid with some on-board autonomy similar in scope to a self-driving car, going on to deploy Europe’s first deep-space CubeSat, and potentially also a micro-lander, to test out a new multi-point intersatellite link technology. Hera will also provide humanity’s first view of a binary asteroid system, proceeding to map the entire surface of Didymoon down to a size resolution of a few meters and the tenth of the surface surrounding the Double Asteroid Redirection Test impact to better than 10cm, through a series of daring flybys. How large a crater will Double Asteroid Redirection Test end up leaving? Will there be larger morphological effects, such as ground cracking, or stones and dust scattered widely compared to DART’s pre-impact images, implying post-collision quaking? Precise mapping of Didymoon’s volume will be combined with radio science experiments to assess how Didymoon’s gravity influences the spacecraft’s trajectory, to derive the asteroid’s density and constrain our models of its internal structure. Hera will also be a pioneer in the novel field of planetary defence: by pinpointing the shift in Didymoon’s orbit to a much greater precision than is achievable from Earth, the mission will give the fullest possible insight into the end result of the Double Asteroid Redirection Test collision – serving up hard data that might one day be used to safeguard Earth, demonstrating how to divert an incoming body before it becomes a threat. What is Hera’s Asteroid Framing Camera (AFC)? 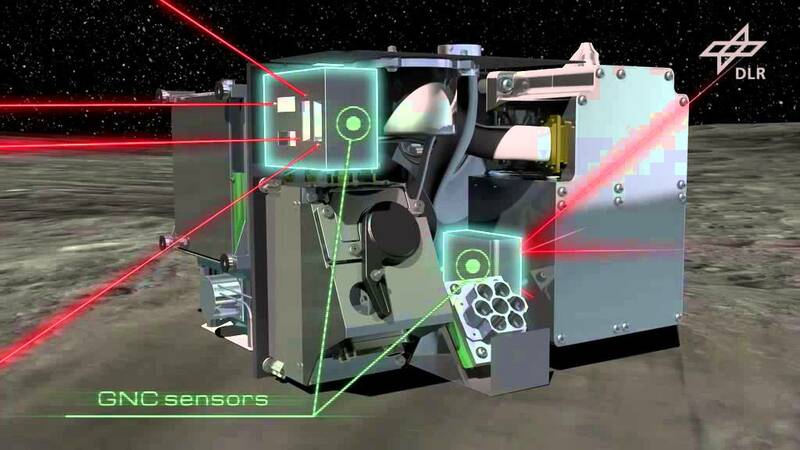 Hera’s baseline payload begins with an instrument called the Asteroid Framing Camera (AFC), to be used for guidance and navigation as well as scientific observation, which is an already-existing flight spare of a German contribution to NASA’s Dawn mission to the asteroid belt. This camera has been distinguished by returning remarkable images of the largest single asteroid, Ceres, and its mysterious bright spots. Now, its sister camera is set to survey the smallest asteroid humankind has visited as well. The AFC is joined by a compact lidar (or ‘laser radar’) instrument to be used for measuring surface altimetry, plus one or more deployable six-unit CubeSat nanosatellites to carry a hyperspectral imager and a second instrument still to be finalised. At the time of writing, Hera still has another 40kg of payload capacity available, which could take the shape of a high-frequency radar for measurement of subsurface properties, a mini-impactor proposed by Japan (a twin of the version currently in flight on Japan’s Hayabusa-2 asteroid mission, see below) or a mini-lander, currently under study by Airbus and DLR, the German Aerospace Center (based on a version also in flight aboard Hayabusa-2). ESA has a long tradition of technology-testing missions being used for ambitious science goals, exemplified since the turn of the century by the Proba series of minisatellites, variously tasked with gathering data for environmental and solar science. Hera follows the same philosophy, even though it will go one better than the Proba family by departing Earth orbit entirely. The single most significant technology Hera will demonstrate during its mission to the Didymos binary is intangible in nature, a software algorithm rather than physical hardware, but one seen as essential to a coming class of autonomous ‘space servicing vehicles’. Hera’s streamlined nature means it will perform its guidance, navigation and control (GNC) activities through an innovative data fusion strategy, combining inputs from multiple sensors to build up a detailed picture of its surroundings in space. That would mean the bringing together second-by-second of visual tracking of distinctive features on the asteroid surface with altimeter distances plus onboard inertial and star tracker measurements. Future servicing vehicles would need to perform comparable data fusion when it comes to rendezvous and docking with satellites intended to be refurbished, refuelled or potentially deorbited. Any mistake in this scenario would lead to catastrophic collision, and plentiful space debris. In the case of Hera, failure will not be an option when it comes to key manoeuvres such as CubeSat (and possibly lander) deployment or close Didymoon flybys, down to a matter of metres above the surface. But what if one or more of the sensor inputs is in error or an actuator delivers the wrong correction to the spacecraft trajectory or attitude? That is where Hera’s ‘Fault Detection, Isolation and Recovery’ (FDIR) technique comes in. FDIR is an approach widely applied in space engineering, ranging from protecting individual electronic components to safeguarding the entire spacecraft: for example, modern space computer chips seeking to make up for memory ‘bit flips’ due to space radiation can perform calculations on a multiple, parallel basis, sometimes voting to decide the most likely truthful result. In a similar fashion, Hera’s data-fusion-based GNC FDIR is designed to identify errors in real time through ongoing sensor cross-checks, isolating them and then making up for them by triggering sensor or actuator reconfigurations or even, in case of extreme emergency, triggering an autonomous collision avoidance manoeuvre. The combination of GNC and FDIR using vision-based sensing was achieved by ESA for the first time in the relatively straightforward but safety-critical case of semi-autonomous docking by the Automated Transfer Vehicle cargo spacecraft to the International Space Station (ISS). Expanding the technique to more challenging rendezvouses in space and increasing its degree of autonomy has been worked on for years in the context of this mission, most recently by GMV in Spain. Success will mark a giant leap forward for mission-critical autonomy. What new discoveries will asteroid missions make? Plenty of new discoveries can be expected from Hera. Each fresh close encounter with an asteroid has led to a fresh transformation in our understanding. A decade ago Europe took its first asteroid close-up, as ESA’s Rosetta probe performed a flyby of 2867 Šteins, a Gibraltar-sized diamond-shaped asteroid in the main Asteroid Belt. Dozens of craters were seen, including a gaping hole at the south pole of Steins – a large impact crater about 2km wide and nearly 300 m deep. A chain of several craters ran towards the north pole from this crater. The low density of Šteins suggests it is a ‘rubble pile’ asteroid, broken apart by previous impacts and held together weakly by its gravity – and probably fated to one day break apart. A second Main Belt asteroid flyby took place in 2010, as Rosetta passed the mammoth 100km 21 Lutetia. This higher-density asteroid was similarly studded with craters, confirming that collision is the main shaper of these primitive bodies. Europe plays a key role in a new asteroid encounter scheduled for this July, when Japan’s Hayabusa 2 reaches near-Earth asteroid 162173 Ryugu. It will put down a micro-lander called the Mobile Asteroid Surface Scout (Mascot), developed by the German Aerospace Center [DLR] (who previously contributed the Philae lander to Rosetta) and French space agency CNES, carrying an infrared spectrometer, a magnetometer, a radiometer and camera. A follow-on version of the Mascot lander, known as Mascot+, is currently under study to be carried by Hera. Additionally Hayabusa 2 will perform its own miniature version of an impactor experiment, called the Small Carry-on Impactor (SCI), consisting of a small 2.5kg copper projectile given added force by a high-explosive charge. SCI will strike with a velocity of 2km/s, offering a valuable bridge between the kind of simulated impact tests performed in terrestrial labs and the full-scale Double Asteroid Redirection Test collision, allowing the testing of impact scaling laws. A follow-up SCI payload is also being considered for Hera, not to attempt to change Didymoon’s trajectory any further but to produce a second crater at a different energy level than DART. This experiment will provide invaluable data to fully validate numerical impact algorithms that will be key to designing any future planetary defence missions. Exploration of these asteroids, and the many others surveyed so far, have highlighted their striking variety in terms of size, shape, surface characteristics and constituent materials. Similarly, asteroids rotate in various ways, from simple rotation to slow precession or rapid tumbling. It is possible that asteroid rotation is constrained by fundamental ‘spin limits’, beyond which centrifugal acceleration would lead material to escape from the surface of rubble-pile bodies. Indeed, such escapes might explain the origin of many binary asteroid systems, which make up 15% of the known total. The internal structure of asteroids remains a blank spot in scientific understanding. Are there large voids within their deep interior, or are they composed of loose regolith or conglomerates of monolithic rock? In particular, there is no way of knowing how an actual asteroid would respond to the specific external stimulus of an impact – short of trying it for real. By shedding new light on collisional dynamics, the combination of the Double Asteroid Redirection Test plus Hera will add to our understanding not just of asteroid formation and evolution but the creation and ongoing history of our entire Solar System – a story etched in impacts. Down at smaller scales, Hera’s surface observations will reveal the range of physical phenomena other than gravity that govern asteroid surfaces, influence their material properties and keep them bound together. What are the relative roles of electrostatic and Van der Waals forces, for instance? One proposal is that the most finely-grained asteroids might resemble ‘fairy castles’, crumbling to the touch. Such findings would hold relevance for asteroid mining as well as planetary defence, while also offering insight into the very earliest microscopic-scale processes of accretion, right back at the dawn of this and other planetary systems. Hera is currently preparing for its Phase B1 study, along with a set of technology developments. The decision on whether the mission will progress to flight will be taken by Europe’s leaders at the end of next year. But certainly planetary defence is a global responsibility, and ESA is currently readying a new programme to be presented at the next Ministerial Council called Space Safety, that places planetary defence together with related topics such as space debris and space weather. DART and Hera were originally conceived as one – the origin of the two missions can be traced back to an ESA 2002 study of a double spacecraft asteroid deflection mission called Don Quijote. If approved, Hera is on track for a 2023 launch, arriving at Didymos for its ‘crime scene investigation’ a couple of years later. The experience of the Stardust crater – as well as the recently discovered crater of ESA’s Smart-1 spacecraft on the Moon – suggests DART’s impact point will be largely unchanged from the moment of collision. Or, in the event of a delay in the Double Asteroid Redirection Test mission, then the pair might reach Didymos at the same time. Either way, a historic moment is coming in the shape of the DART impact. Humankind will draw maximum benefit from it through a close-up view. 65 million years ago, the most famous asteroid in history slammed into Earth and most likely exterminated the dinosaurs. Disconcertingly, we are no less likely to be to hit by an asteroid today than our ancient reptilian counterparts were — but luckily we have helpful tools at our disposal. In 2015 ESO joined the International Asteroid Warning Network (IAWN). To find out what this entails, we talked to Andy Williams, ESO’s Institutional Relations Officer, and Olivier Hainaut, an ESO astronomer in charge of NEO follow-up at the VLT. Q: What are asteroids and why should we be worried about them? Oli: An asteroid is “just” a rock, or a pile of rocks, that orbits the Sun. Some asteroids are dead comets — those that have lost their ices so the comet is covered by a rocky crust. My work at ESO focuses on minor bodies such as asteroids, comets and trans-Neptunian objects — including those with the potential to smash into Earth. We call these Near-Earth Objects, or NEOs. Currently, we know of about 17 000 asteroids and 100 comets that are classified as NEOs. 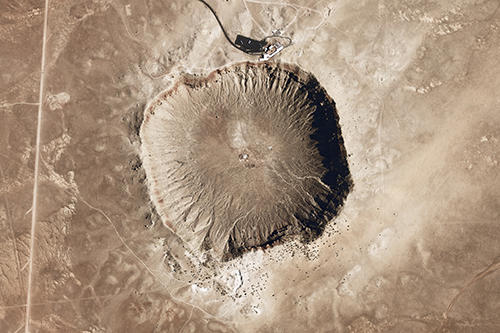 Meteor Crater on the Colorado Plateau in Arizona. This crater is 1.2 kilometres in diameter and was created by a 46-metre asteroid 50 000 years ago. A key number to remember with NEOs is 10: if an asteroid 10 metres across hit Earth, it would release about the same amount of energy as the Hiroshima bomb. As its effect would be localised to within a few square kilometres around the impact site, it’s unlikely to do a large amount of damage. Remember that the surface area of the Earth is huge and a lot of it is taken up by the ocean, so it would be incredibly unlikely — and extremely unlucky — for an asteroid 10 metres across to severely damage a populated area. But the energy that an object releases is proportional to the cube of its size — so in comparison, a 100-metre asteroid (with the same composition and speed as the 10-metre asteroid) would release 1000 Hiroshimas. An asteroid with a diameter of one kilometre would do much greater damage, and an asteroid of 10 kilometres would be like the one that killed off the dinosaurs. It would sterilise an entire continent and cause major global damage. On average, one of these huge 10-km asteroids strikes Earth every 50 million years, and the last one was 65 million years ago — meaning we are now overdue. Of course, I should mention that I’m not too worried about an asteroid wiping out all of humanity. We know about most asteroids of this size in the Solar System – we’ve studied their orbits, their characteristics, and we can predict their chance of impact. But as the asteroids get smaller, the less we know of them. We estimate that about 70–80% of asteroids from 500 metres to 1 kilometre in diameter are known, but only about 10% of asteroids 100 metres in diameter are known. The International Asteroid Warning Network (IAWN) is working to improve these numbers. Q: So what is the IAWN? Andy: The International Asteroid Warning Network aims to detect, track, and physically characterise Near-Earth Objects to determine which are potentially dangerous to Earth. The network is made up of scientific institutions, observatories, and a variety of interested groups — all of which can make observations of asteroids and NEOs. Participation in the network is voluntary and partners are funded with their own resources. They also agree to a policy of free and open exchange of all data submitted to the network. Q: How did the IAWN form? 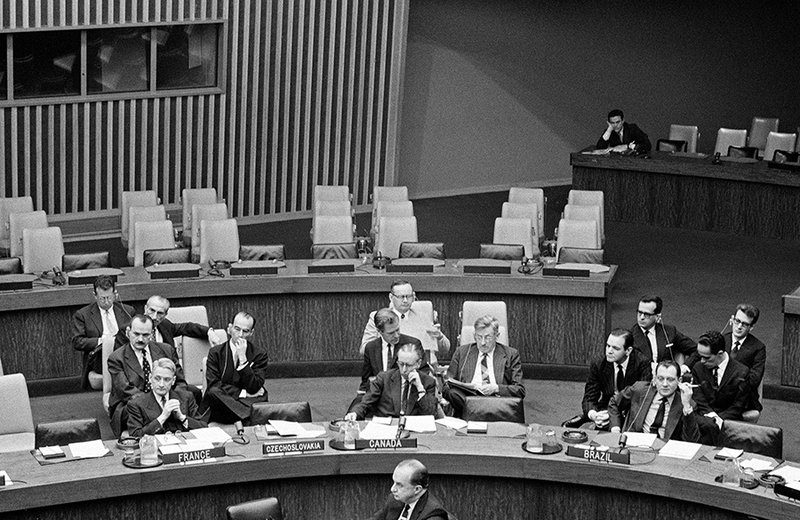 Andy: The network has its roots in the United Nations Committee on the Peaceful Uses of Outer Space (UN COPUOS), which was established in 1959 shortly after the launch of Sputnik. NEO detection happened for years by observatories around the world, including ESO, but in 2002 the UN committee decided there should be a single team to oversee the detection, risk analysis and communication of NEOs and their dangers. By 2008 two vital organisations had been set up: the International Asteroid Warning Network (IAWN) and the Space Mission Planning Advisory Group (SMPAG). The establishment of these groups marked a tangible and essential step in protecting Earth from potential asteroid impacts, and the IAWN, in particular, was crucial in collecting and sharing information about potential space hazards. Then in 2013, the Science and Technology subcommittee (STSC) gave IAWN the official role of NEO detection. By cosmic coincidence the Chelyabinsk meteorite struck the atmosphere above Russia on 15 February 2013 during the STSC meeting, giving immediate impetus to this work! Q: What is ESO’s role in the IAWN? Oli: To search for asteroids you need a survey-type instrument such as Pan-STARRS, which continuously scans the whole sky with the aim of detecting moving objects. ESO’s telescopes are very powerful, but have a narrow field of view and so are used to observe specific objects; in other words, they are not suitable for discovering NEOs. So we work as part of a team. Other huge surveys detect asteroids, some of which are considered potentially hazardous — and some of these are threatening enough get on ESO’s “to-do list”. Our role is to target the high-risk asteroids that no other observatory can observe. If an object is small or far away, only big telescopes like ESO’s Very Large Telescope get called on to hone in and measure it. In collaboration with ESA, we’ve run an ongoing project on the VLT since 2015. The project is awarded 24 hours of observing time per year, and while this time is modest, it’s enough to follow-up all the potentially dangerous NEOs that cannot be observed by smaller telescopes. 58 high risk or difficult NEOs have been observed by the VLT so far, 24 of which were removed from the risk list—the others are still on the list, despite the VLT observations. Andy: It’s really important to note that as an intergovernmental organisation, ESO has a great responsibility to the public who ultimately pay for what we do. The Director General decides on the 24 hours set aside per year for asteroid observations using the VLT. Q: How do we calculate the risk and the probability of an asteroid hitting Earth? Andy: Short answer: it’s complicated. The risk is a combination of the likelihood that an asteroid will strike, how soon it will strike, and the effects it would have on Earth. Astronomers use the Palermo Technical Impact Hazard Scale, which combines these values and also compares it to the ‘background’ level of risk. We have to consider many variables. Firstly, the orbit of the asteroid must be determined, along with the chance its path could intersect with Earth’s and when this would happen. Next, the size of the asteroid is vital, as it provides the main indicator of its danger — a large asteroid would slam into Earth’s surface intact, while a smaller one would burn up harmlessly in our atmosphere. The danger also depends on composition; some asteroids are basically huge chunks of iron ore, which can hold together as they pass through the atmosphere, while others are loosely-bound dust, ice and rocks, which burn up more easily. Then we must consider the angle of incidence — whether the asteroid travels straight down or at an angle, passing through much more of the atmosphere. In this case, the asteroid experiences more friction and is more likely to reduce in size (and danger) or be vaporised altogether. For most NEOs, these parameters are unknown, so we have to work with average, typical values. The Chelyabinsk asteroid that struck Russia in February 2013 passed through Earth’s atmosphere at a 20-degree angle and was quite small, approximately 20 metres across. It skimmed the atmosphere like a pebble over water and fortunately exploded before it reached the ground. The Chelyabinsk meteoroid fell to Earth on February 15, streaking across the sky above the city of Chelyabinsk, Russia, at 9:20 am local time. Q: What happens if we find an asteroid at high risk of hitting Earth? Andy: Certain criteria have been set up that trigger an impact response. If the probability of impact is greater than 1% for objects over 10 metres, IAWN must alert the Space Mission Planning Advisory Group (SMPAG), of which ESO became an observer on 11 October 2017. SMPAG then have the harder job of coming up with an international action plan and deciding on the criteria for action. If the probability of impact within 20 years is greater than 10% for objects over 20 metres, SMPAG must alert authorities and the United Nations to begin terrestrial planning, which includes determining a “risk corridor” on the earth’s surface. If the probability of impact within 50 years is greater than 1% for an object of over 50 metres, SMPAG must begin mission planning. Much of the current work of SMPAG involves analysing the various mission options. Q: And what are those options? Oli: There are many possible hazard mitigation methods that are being considered, all of which sound very dramatic and sci-fi. It might seem like the best option to avoid a large predicted impact is to destroy the asteroid — but this isn’t such a good idea. We don’t want to break up the asteroid because it would dramatically increase the number of impacts and the likelihood they’d hit human populations! Not to mention the difficulty of tracking all the fragments. 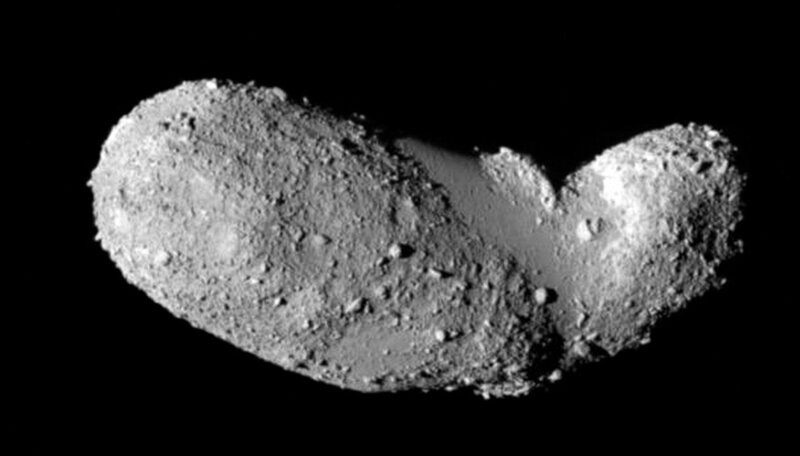 A close-up image of asteroid (25143) Itokawa taken by the Japanese spacecraft Hayabusa during its close approach in 2005. A much better option is to deflect the asteroid. One idea is to spray paint one side of the asteroid white, making it more reflective — so when photons from the Sun bounce off, their momentum will transfer to the asteroid, pushing it off course just enough to miss Earth. This technique is based on the phenomenon of the Yarkovsky effect. Another idea is to send up a small rocket to push the object gently off course over a long period — say, 10 years. Basically, if we know about a potential impact long enough in advance, we can do something about it. We already have the technology today. Andy: Like Oli said, the extent of our preparedness will largely depend on the amount of time we have — obviously a 20-year warning will be different to a 2-day warning! Lots of people are thinking about mitigating the hazard of asteroids — NASA has the Asteroid Impact and Deflection Assessment (AIDA) Mission, and ESA used to have Asteroid Impact Mission (AIM) although at present its funding is unclear. Q: Does the recent discovery of the interstellar asteroid `Oumuamua affect our understanding of NEOs? Oli: Our team at Pan-STARRS first spotted the `Oumuamua asteroid. This was an interstellar object — the first ever discovered — that briefly became a Near-Earth Object, except it was travelling much faster, meaning it would have been extremely damaging if it struck the Earth. We think that over its lifetime, our Sun has ejected tens of trillions of objects into interstellar space, so it’s reasonable to assume that other stars, including our neighbours, have done the same. This means there are a huge number of interstellar objects travelling through space. But when you compare this with the sheer scale of the Universe, the likelihood of even coming across one is exceedingly slim — and the chances of an interstellar asteroid striking the Earth are negligible. Furthermore, there would be not much we could do to mitigate such an impact because we’d have just a few weeks’ notice. It is better to focus our efforts on the much higher risk from our own Solar System’s NEOs.